ask grandma j: DO THEY TAKE COUPONS? Eli's Manhattan has decided it isn't enough to charge five times the national average for a one pound bag of carrots.....which would be $4.50. Unless you're a cheap chump who schleps her way to Walmart or H.E.B. or somewhere else and pays $.79 for the same bag. No siree! Eli's wants to take full advantage of the energy crisis and charge a surcharge on top of their already high prices. Now, I don't shop in gourmet markets because there aren't any in Central Texas Walmart has a Gourmet Half-Aisle. It has all the fancy pickles and mustard and maybe some artichoke hearts floating in marmalade. 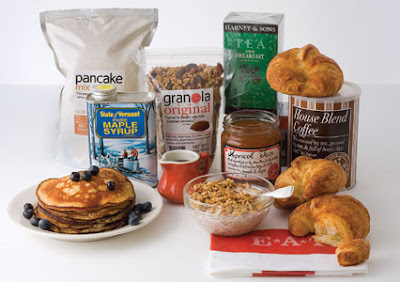 I know I would never pay $150.00 for this breakfast basket, even if they threw in a couple extra croissants. Now add the energy surcharge...BINGO! $152.70. I love good bread....fresh bread, with some weight to it and lots of fiber and never white. But would I pay $55. for four one lb. loaves? 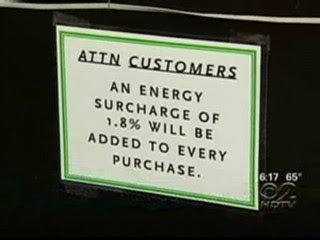 Don't forget the energy surcharge. 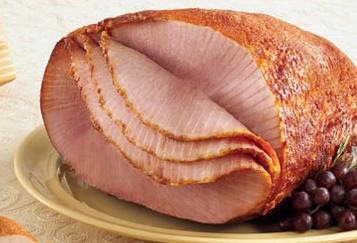 A seven lb ham is $95. 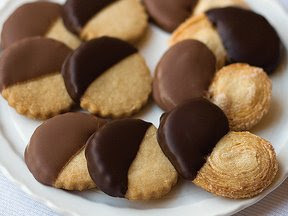 How about one lb of hand dipped chocolate shortbread cookies....only $45. So please Mr. Eli's.....why the greed? I would guess you already make a nice hefty profit. You will never make up the loss in revenue that your former customers have taken elsewhere because of your stinking 1.8% energy surcharge. 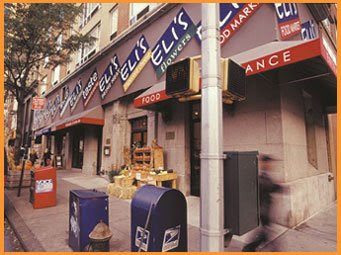 Does anyone know of anyone who shops at Eli's? Still? I've never heard of Eli's and it's just as well. If I'm going to hand a cashier 95 dollars, I'm going to be pushing a cart of groceries that will last at least half a week if not longer, not toting a ham under my arm. I also never have heard of Eli's. I would never spend that much money on food. Even if I had the money, what a waste. If I did spend that much money on breakfast, it have better be in bed, in a 5 star hotel and served by George Clooney. I like food as much as the next gal, but I would starve before I would pay those prices. 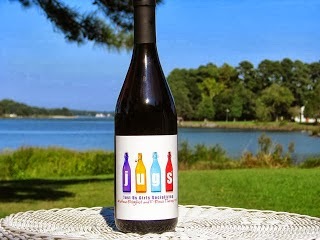 Of course, if we were discussing wine, THAT might be a different story. I've never seen an Eli's. And I won't be looking for one with those prices! WHAT THE FREAKING HECK! Are you serious? I don't go into expensive stores like that. Do you want to know where I get my gourmet goods? Ross' or Marshall's CLEARANCE aisle : ). We don't really eat a lot of gourmet things and I am pretty sure we will NEVER shop at this market. If I ever pay $55 for four loaves of bread, please shoot me : )(in the foot only) Thanks! I am going to google right now to see where this market is. ARE THEY CRAZY? Gees Louise. This is going to bother me all day : )! I just hate that. But if people have enough money to throw out the window and are too lazy to shop around...that's their fault! Can you say "suckers?" What's sad - there are apparently a lot of people that are stupid enough to pay those prices!! It's the same kind of idiocy around the fashion industry. We lived in West Palm Beach for a while. One afternoon, I went to Worth Avenue which is like Rodeo Drive. The prices were CRAZY!! I remember one little tank top, nothing special, no special design or beadwork. Just a yellow tank that was designed by someone that I had never heard of - it was $5000.00!! Boy that place sounds alot like Gelson's in Newport Beach. Years ago it was a bit high, but the quality was high, and the produce was worth it for special occasions when you needed strawberries the size of volkswagons. Today I can't even set foot in there. It's always full of snobs spending like crazy. Even if I were a billionaire, I wouldn't shop there--based on principle alone. I am a true foodie, but I wouldn't shop there because of the energy surcharge (and we're both teachers and couldn't afford it.) They could just raise their prices a couple of cents if they were that desperate for money and no one would probably even notice. But to put a sign up...lame. My guess is the higher costs of everything are already being passed on to consumers, Eli's is just being upfront about it... I'm not sure I think it is a bad thing, but it does sort of beg a person to cross the street and purchase coffee at the corner bodega.